*I have the password, let me see the use case with screenshots! 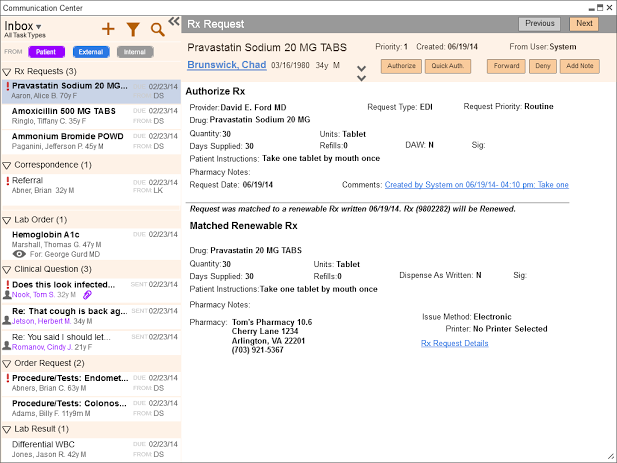 During the version 9 release, it was planned the Greenway Patient Portal would be integrated with Intergy EHR and Intergy Practice Management (PM) in the next version, version 10. Patients would be able to send messages from the patient portal to their providers on Intergy. As a user, I would like to have all my communications from other practice users and patients to be in one easy to use location so I can complete my work efficiently. The Intergy tasking system is used for interoffice tasking and messages. 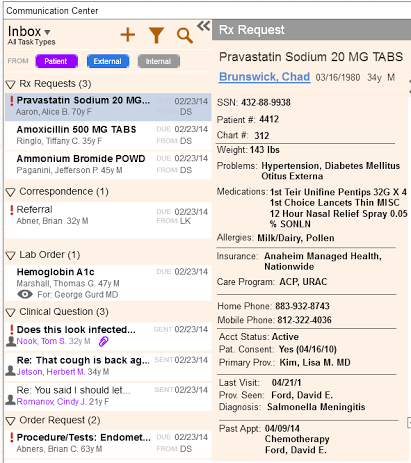 The tasks system existed in both Intergy EHR and Intergy PM. However, it used different terminology, displayed the information differently, displayed different information fields, and had different aesthetics between the two systems. As a user, I would like my tasking system to be uniform across Intergy EHR and PM so I have one set of expectations for how to work a task or message. It was recognized that the tasking system would be the best vehicle for the patient messages to reach the healthcare providers but the current tasking system was deemed insufficient for those needs. Versions 9.20 and 9.30 were devoted to improving the tasking systems. There was an existing module in the product who’s interaction model displayed the task list at the same time as the details for that task. That model had been well received by users and it was decided to base the tasking system around that model. Continually gathered questions for focus group of users. The action buttons (Complete, quick complete, reply, forward, add task note) are dynamic based on task type but are always in the top right corner of the task details pane. The task notes collapse and show the timeline of the task with the most recent action visible at first glance. The design was taken through many iterations in response to PM needs, multiple focus groups, developer and time limitations, and one-on-one usability testing. The Inbox/Sent box, Filter icon, and sort icon were all combined in one window. Search is always available without a click, and highlights the searched terms in the list. The task type headings in the task list were removed due to performance issues. May be added back in after architecture upgrade. Usability updates were added in version 10.0, in response to issues that arose after the version had been in the field for a while.